What role did Nova Scotia’s Mi’kmaq play in the War of 1812? 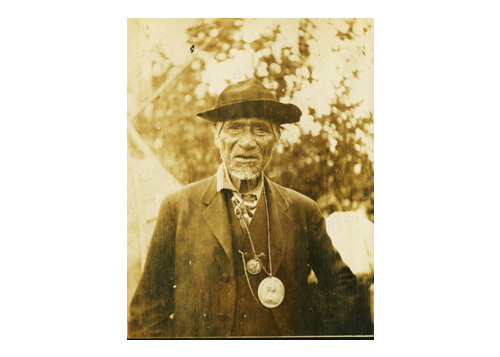 Credit: Chief James Meuse, wearing George III peace medals, private collection of Tim Coggeshall. North America’s First Nations communities played a variety of roles in the War of 1812. Some communities allied and fought alongside the Americans, while British troops and Canadian militias were supplemented by thousands of First Nations warriors and Métis fighters. While the support of these allies helped both sides achieve major victories, there remained some First Nations communities who refused to “choose a side” and instead, chose neutrality. This was the case with the Mi’kmaq. Thirty seven years earlierduring the first years of the War of American Independence, the Mi’kmaq were seen as a major military force that supported the Americans. For the remainder of the war, thanks to the efforts of Michael Francklin, superintendant of Indian affairs for the province, the Mi’kmaq vowed to remain neutral. This neutrality continued into and throughout the War of 1812. As a result, the Mi’kmaq chiefs were presented with the George III peace medals and gorgets at the end of the war in 1814. For many years, these were regularly worn by Mi’kmaq chiefs to denote their political position and/or status. Despite their neutrality, the Mi’kmaq, as well as all other First Nations communities who both participated and remained neutral, are viewed by historians as having the most significant losses due to the War of 1812. For the Mi’kmaq things changed dramatically after 1814, as they were no longer seen as a major political or military threat. Subsequently, the state of affairs of the Mi’kmaq became more tenuous than at any other time in the past. View the “King George III, 1814 Medal” and the “Mootsh’kole or gorget” given to the Mi’kmaq at the end of the War of 1812, and later photographed and catalogued by Harry Piers, one of the Nova Scotia Museum’s first curators. View the Nova Scotia Museum’s “Mi’kmaq Portraits Collection”, which contains several portraits of Mi’kmaq men wearing the King George III peace medals and gorgets. The Dictionary of Canadian Biography’s entry for “Michael Francklin”. The “Medallic History of the War of 1812: Consequences to American Indian Nations” [PDF 8.85 MB]. “Aboriginal Contributions to the War of 1812”, provided by Aboriginal Affairs and Northern Development Canada, details the roles that other First Nations community played in the War of 1812.